Update: Apple has now announced watchOS 3 and the new software update will be coming to Apple Watch devices in the near future. You'll be able to get it on your Apple Watch later this year. For now though you'll get to explore all the latest and greatest watchOS 2 features. WatchOS 2 launched in September 2015 with a plethora of new features and updates to Apple Watch features you already loved. Since then, we have seen it updated four times and the latest software for your wearable is watchOS 2.2.1, which is based on iOS 9.3.2. If you haven't updated your software already, it's certainly worth doing. Siri is smarter, public transit will show up in Maps and there are new watch faces. 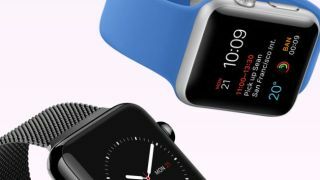 If you own an Apple Watch, here are all the key reasons you should upgrade it to the latest software. It's out right now and you'll likely already have it on your watch. If you don't, you'll be able to download it now. WatchOS 2.2.1 is the latest software upgrade and most of the upgrades since the original watchOS 2 release have been minor improvements. There have been a lot of fixes to stability issues and even the latest upgrade - watchOS 2.2.1 - just focused on performance issues. Problems have been fixed such as limits on only being able to pair one Apple Watch with your phone, calendar issues and third-party app icons breaking. There's also support for a new range of languages for those who can speak multiple tongues. WatchOS 2.0.1 was perhaps the most important though as it fixed issues with the battery performance as well as bringing in the new emoji characters that were included on iOS 9.1. WatchOS 2 brought a new selection of third-party apps with it. The Facebook Messenger app for Watch allowed you to be able to text, send audio files and share locations right from the wrist. GoPro can lets you use the Apple Watch as a viewfinder so that no matter where your camera is mounted, you'll always know where it's pointed. iTranslate lets you see, hear and translate over 90 languages by speaking to your Watch. This was all possible as devs now have access to the smartwatch's sensors and controls like the Taptic Engine, Digital Crown and more. It means we're beginning to see native apps for the platform, opposed to ones that are simply ported over. Native apps allow faster run time and greater app capabilities. The Digital Crown provides functionality beyond zooming in and out. Rotating the crown lets you 'Time Travel' showing various events up to 72 hours into the future or past events, right on the watch face. Weather and news headlines are also other complications that Time Travel will work with. It's cool seeing what the weather will be like, and if you've got your calendar set up perfectly it's neat to see what appointments are coming up. But until more third-party apps offer complications for this section, we can't say we're enamoured. The microphone is accessible to other apps now, which means developers are also be able to use your voice in their builds. Developers now have access to the accelerometer too, so you can expect future apps to utilize this feature more. Previously capped at 15 seconds, the Apple Watch is now able to stay on for a whopping 70 seconds; why you'd need this we've not quite worked out, but that option is nice to have. Yes, this sounds exactly like what you think it is. The Apple Watch is able to connect to open Wi-Fi networks without needing to connect to your iPhone first. You can leave your phone in another room and your wrist will be a perfectly suitable alternative. It's been hard to find a time to put this into practice though – you can keep the Watch connection alive in most homes thanks to being close enough. There were 10 customizable Apple Watch faces at launch, and as we expected we've now got more to play with. Modular looks much nicer with more colors to play with (along with the extra complications to check out). Time Lapse: Apple shot time-lapse videos over 24 hours in Hong Kong, London, Mack Lake, New York and Shanghai to create these new faces, and Paris was recently added to the mix. This is one that we're really in to, as it adds an element of dynamism to the Watch, with movement every time you lift your wrist. It would be brilliant if you could film your own time-lapse here and code it to the correct time stamps; given that the iPhone 6S is going to have a stabilized time-lapse mode, this could be awesome. Photo and Album modes: Just like iPhone backgrounds, your collection of pictures is now fodder for your smartwatch faces. It takes a bit of work to get the right photos on there (you have to choose a specific folder to use and then sync it to the Watch), but it adds a really personal touch to your wrist. It's hard to work out how to get a single photo on the background though – you'll need to fiddle around a lot to make this work. Live Photos, enabled from the iPhone 6S by taking a 1.5-second video before and after the shot, will be able to play automatically on the Watch. So if you're thinking of getting a joint bundle of Apple products, you'll like this dynamic new feature. The interface for Music looks a bit different after the update as it's been redesigned with new features. Quick Play has been added to make it easier to shuffle your music, a volume level indicator will be displayed, and the source of the audio file will also show up. New 'complications' or information in the various watch faces will be able to display third-party apps, although we've currently not seen much from apps that can be added in here. Flight times and home-controlled systems with Homekit devices will be accessible from your wrist, and your electric car charging information and more should show up soon. The complications can be changed on the Modular face and most of the other faces. Nightstand mode flips your Apple Watch face to show horizontally while it's charging. The Digital Crown becomes a snooze button and the side button turns off alarms. If you're not a fan of lights, the display screen won't show unless you touch it or one of the buttons. It also begins to light up as you get closer to your alarm time – while it's never woken us up with the gentle glow, it's a nice mini alarm clock to have by your side. One option that has been sorely missing has finally made it onto the Apple Watch: email replies. Just like text messages, you're now able to reply directly from your wrist with voice dictation, emojis and smart responses. However, you can't edit your messages – this is more about being able to archive or flag messages from the wrist, rather than them being locked into your phone.